In 2004, Kevin Malarkey and his son, Alex, were in a terrible car accident, leaving Alex completely paralyzed. When Alex woke up after being in a coma for 2 months, he was filled with remarkable stories of how the angels took him to the gates of Heaven and how he met Jesus face to face. 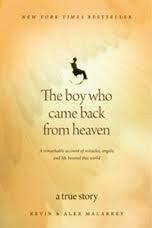 This book recounts Alex’s amazing journey and will leave those who read it with new insights on miracles and life beyond this world. Kevin Malarkey will be speaking at the Holiday Inn Express Hotel & Suites on Sunday, April 15th from 1:00 – 5:00pm. He will be available to answer any questions people may have regarding the book and Alex’s story, as well as there to sign copies of his book.